The other news, while not quite as dramatic, is about bibliotherapy the prescription of self-help books to people suffering from anxiety or depression. The British Reading Council, a partner in the initiative is also suggesting books to inspire and uplift peoples’ spirits. They have developed a core list of Mood- boosting books and are inviting people to share titles. Shakespeare’s Richard lll is not among them. ng, a program that integrates the arts and literacy. This work coupled with my love of book illustrations has allowed me to surround myself with a wide variety of delightful picture books. In Artful Reading, the books are often shared through an interactive read-aloud. The strategic choice of picture books for read – aloud can help set the classroom mood and the environment for learning. Picture books are complex and can be quite sophisticated with multiple stories being told through words and visual language. The combination of words and pictures can leave us amazed, perplexed, howling with laughter, or filled with a sense of wonder about the world. 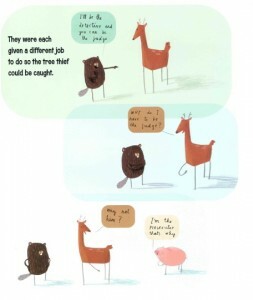 The Great Paper Caper by Oliver Jeffers invites readers to look closely at the illustrations and interpret an array of clues and occurrences. In the Great Paper Caper stick-legged characters spread across a curious landscape pull us into the mystery of disappearing tree limbs. The twist in this story is that we know who the culprit is from the beginning, but are immediately engaged by the launch of investigations, flimsy alibis, the examination of clues, and mock trials. An additional treat is the use of the front and back endpapers to introduce examples and directions for, “pulp-based aeronautical excellence”. 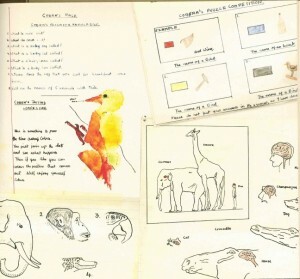 This is a fine introduction to informational text features and loads of fun. The book sets the tone for working together, solving problems and hands-on learning. It leaves you giggling. 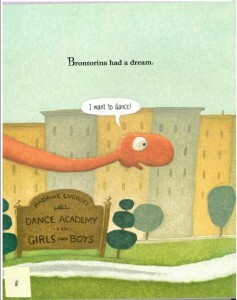 The last page in the story says: “And it all began with a dream.” Brontorina has a dream and works very hard to achieve it despite the difficulties she encounters along the way. The pursuit of dreams, support of friends, and the effects of dreams on others is a wonderful lesson. If you have a moment, share some of the books that are mood-boosters for you, then take a walk outside. This entry was posted in Blog and tagged Artful Reading, picture book, reading. Bookmark the permalink.